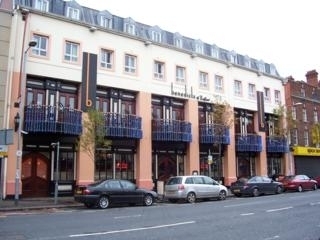 Well known by both locals and visitors Benedicts is a busy city centre music pub. It attracts an older crowd, along with visiting hens and stags from all over the UK and Ireland. The music is wide and varied, mainly DJ led, but live bands take to the stage mon - wed. The restaurant is very popular and booking is recommended, and if you want a room (highly desirable and finished to 5 star standards at a 3 star price)then cross your fingers and book well in advance, the rooms are in high demand !!! Have you got Google Earth on your computer? If so, then download the Google Earth view of Benedicts. Is this the wrong position for Benedicts? If you think so, then modify its position. Click / Tap the button above to get directions from where you are to Benedicts. I love Benedicts. The food is lovely and the music is good on Friday/Saturday nights. The place can be a bit too crowded at times, but overall it's great. Never at probs getting in and I've hardly seen any trouble at it. Went to Benedicts on a Saturday night and I am in my early thirties and have to say the music is terrible especially the rave music. If this bar is meant to be for an older crowd maybe you should consider changing your music. looking at the previous reviews i can see that they are outdated....yes the music is good and the atmosphere used to be good....however the choice of doormen is much to be desired. Myself and a few friends (in our thirties) were turned away twice for being too old. seems like they only want young ones here...i definatley wont be back and would not recommend this place again!!!! BENECICTS IS GREAT. EVEN THOUGH IT AN OLDER CROWD THAT THE LIKES OF THE HOLE BOX OR BEACHCLUB. GREAT MUSIC NO MATTER THE NIGHT AND EVERYONES GAME FOR A LAUGH. ONLY DOWNSIDE IS THAT YOU ARE IN A HOTEL AND DRINKS ARE DEAR . . . BUT ITS WORTH IT 9/10!! i think benedicts is really good the music is really good even there food is really nice the staff r friendly! i recommend it to any1! !